Do it yourself! 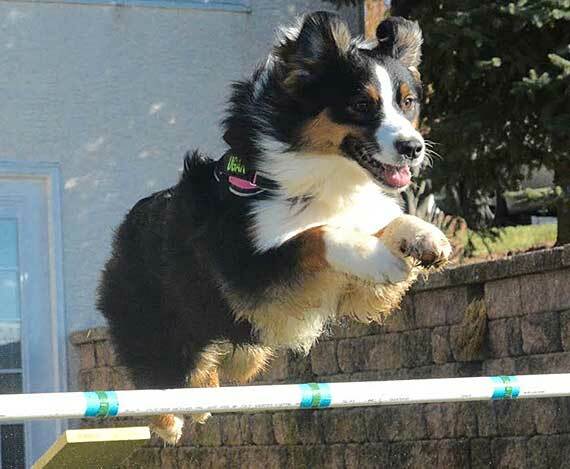 In my previous article about starting dog agility, I showed you the downsides, as well as the fabulous upsides, to competing and working with your Aussie in the sport of agility. This article will be about making your own agility equipment out of simple things you can find in and around your house! 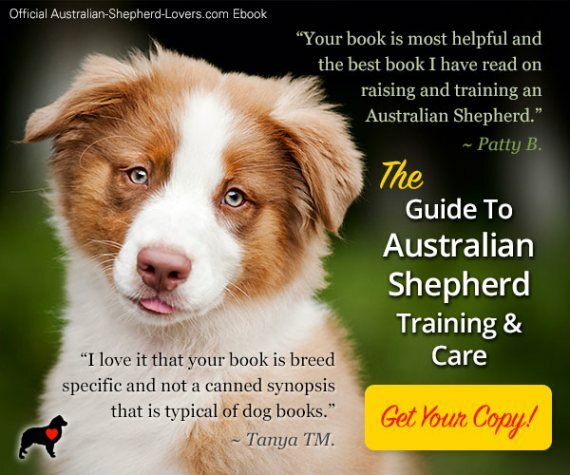 Before you read any more, just remember that dog agility can be easy for your dog to learn, but it can sometimes be very stressful for you. Also, getting to a beginner level is almost effortless, but it takes real patience and dedication to get you and your dog to anything above that. Now that you know a little bit more about the time you will have to commit to making sure you and your dog feel and act like a team, let's get started! 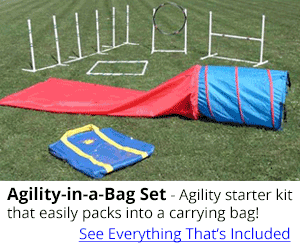 Agility training equipment can be purchased inexpensively from places like AffordableAgility.com or made yourself if you are a DIYer. As you may have seen when watching videos online or on TV, the bar jump is one of the obstacles that is focused on the most, and when people think of agility, they automatically think of the bar jump. The best part... it is a really easy obstacle to build yourself! For example, if you want to make a bar jump in a park or somewhere where you just want to show off your skills, you can use nature, such as logs, sticks, rocks, etc. 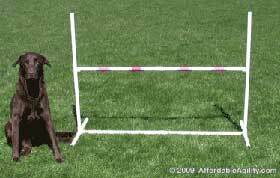 While these may not look like real agility training obstacles that you would find in a competition, they're great to use so your dog is used to doing things that are not typical. Another bar jump option is built with PVC pipes. These are my personal favorite because they're cheap, easy to build, easy to take apart for travel or storage, and are very similar to what your dog would encounter at a competition. 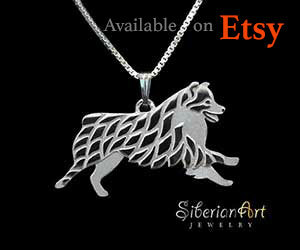 Designs and specialty parts can be found online. Lastly, you can build your bar jump out of wood or plastic. This is probably the most time-consuming bar jump to build, but they are easy to customize, and you can find the measurements online. If you're not a do-it-yourselfer, you can also purchase official dog agility equipment at AffordableAgility.com for inexpensive prices and easy assembly. 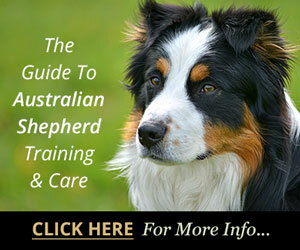 To begin training your dog with a bar jump, see my previous article, Starting Agility With Your Aussie. 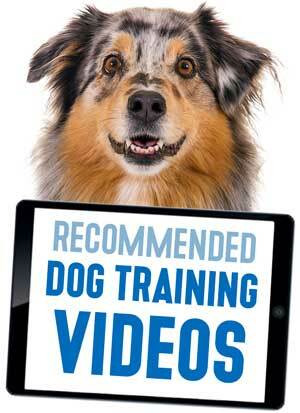 Of all the dog agility equipment you can build yourself, this one's probably the easiest! You can use items already in your house and even practice inside! To start, place a hula hoop or dog bed on the ground. There are many ways to train with the pause table, but I like to use myself as a reward! I personally will sit inside the hula hoop or on the dog bed, and wait for my dog to come over and sit on me. Once she touches the DIY obstacle, I reward her by pulling out a tug toy and playing with her for a minute. Eventually, I stand on (or in) the obstacle, and just wait for her to step in. After a few days, she learns that the obstacle equals praise, and she even goes in there on her own! If you get past that point, you can make your own table by using a staple gun to staple a towel onto a piece of plywood. You can find the official requirements online. 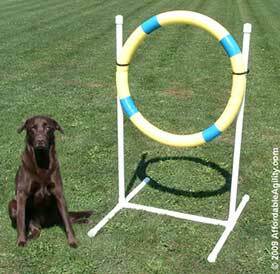 Lastly, a fun DIY dog agility obstacle is the tire jump! 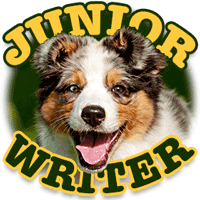 For my dog, I use a breakaway hula-hoop, and I built a frame out of PVC pipes, but there are many colorful and fun hula-hoops to choose from at almost any children's toy store. At most agility training competitions, a "breakaway" agility tire is used, so if your dog gets stuck in the tire, the bottom will break apart and your dog can pull himself out without getting stressed or hurt. I use a "breakaway" hula-hoop, which just disconnects at the bottom; often, the inexpensive "dollar store" hoops are easy to disconnect. 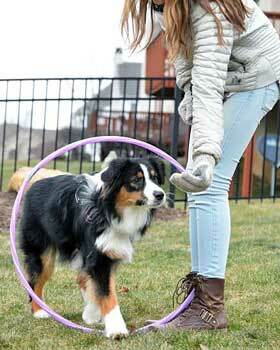 When training with your dog agility tire or hula-hoop, start by holding it low to the ground. 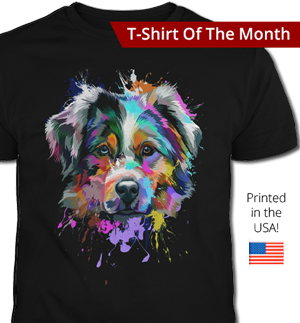 Make sure to wait until your dog steps through and then reward. Raise the hoop until he feels comfortable with jumping through it; then you can attach the hoop to the PVC frame. I would also suggest teaching your dog the bar jump before the tire, because of how similar they are. The size of the tire can be frightening for a dog, so I would definitely use a hula hoop before working with an official agility tire. Remember, positive training methods are important. Pieces of kibble, or tiny pieces of cheese or hot dog are perfect motivators, but your high-pitched, happy, voice is just as important as treats. Don't worry about trying to run through a course quickly at this point; you're still at the beginning and want to make it FUN at every step! 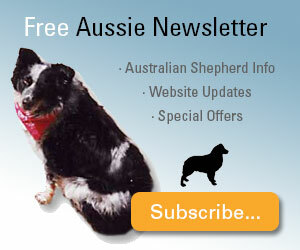 Please continue checking here for more starting dog agility articles! 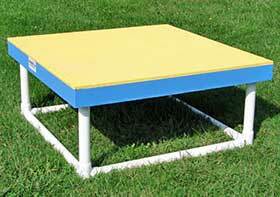 When you are ready you can get inexpensive agility equipment that you can set up in your yard or nearby park. 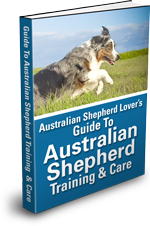 You can get just about anything you would need at places like Affordable Agility or visit our associated Australian Shepherd Lovers Agility Equipment Store here.